Graceful arches and copper roofing give this charming home immediate curb appeal. The interior is filled with striking details and exciting extras. An off-the-kitchen utility room includes abundant counter space and a pantry, while the screen porch features a built-in grill that is perfect for summer cookouts. A generous open living space between the kitchen, dining and great room creates a natural traffic flow and spacious entertaining area. Cathedral ceilings adorn the formal rooms, as well as the master bedroom and versatile bedroom/study. With two walk-in closets, twin vanities and a separate shower and tub, the master suite promotes relaxation and convenience. When welcoming guests through the front door, the impressive foyer features a 12-foot ceiling and art niche for displaying collectibles. 1st Floor: 2361 Sq. Ft. 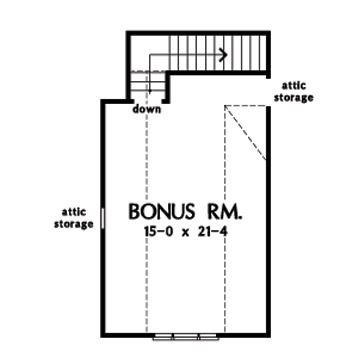 Bonus Room: 368 Sq. Ft.
Porch - Screened: 176 Sq. 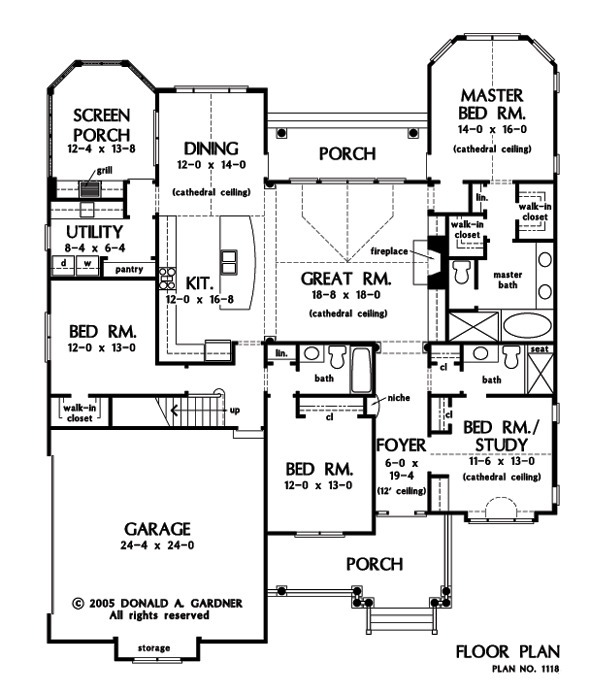 Ft.
House Dimensions: 58' 0" x 71' 2"
Great Room: 18' 8" x 18' 0"
Master Bedroom: 14' 0" x 16' 0"
Porch - Front : 21' 0" x 7' 0" x 12' 0"
Porch - Rear : 18' 4" x 6' 0" x 9' 0"
Porch - Screen : 12' 4" x 13' 8" x 9' 0"
Master Bedroom (Cathedral): 14' 0" x 16' 0" x 16' 8"
Bedroom / Study (Cathedral): 11' 6" x 13' 0" x 14' 4"
Bedroom #3 : 12' 0" x 13' 0" x 9' 0"
Bedroom #4 : 12' 0" x 13' 0" x 9' 0"
Foyer : 6' 0" x 19' 4" x 12' 0"
Dining Room (Cathedral): 12' 0" x 14' 4" x 15' 8"
Great Room (Cathedral): 18' 8" x 18' 0" x 15' 10"
Kitchen : 12' 0" x 14' 4" x 9' 0"
Utility Room : 8' 4" x 6' 4" x 9' 0"
Bonus Room : 15' 0" x 21' 4" x 9' 0"
Garage : 24' 4" x 24' 0" x 0' 0"
Garage Storage : 9' 0" x 2' 0" x 0' 0"